KIDS were greeted with a hearty breakfast of bacon and eggs on toast for the first day of school on Wednesday. 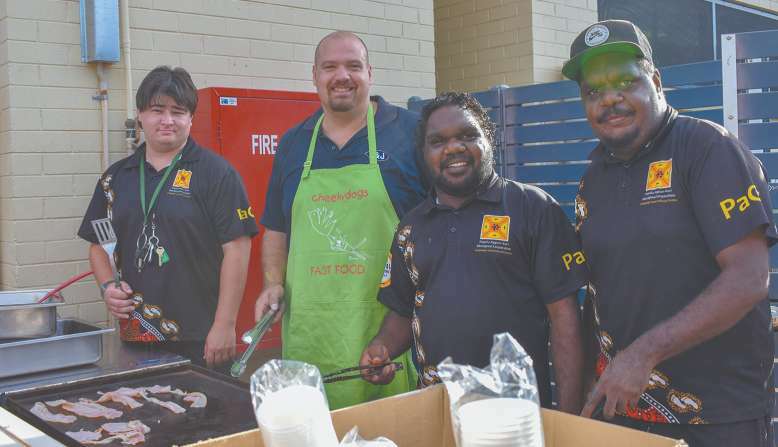 The brekky was prepared by the Remote School Attendance Strategy (RSAS) team, Parent and Community Engagement (PaCE), Tennant Creek Primary staff and Deputy Mayor Kris Civitarese to welcome the children back to another year of education. Next week the RSAS and PaCE teams (also known as the Yellow Shirts) and the Primary School will join forces to encourage as many children to attend school every day. Attending school daily is vital to ensuring our children obtain the best access to education. RSAS Program Manager Anita Mayers urged parents and carers of school-aged children to encourage them to go to school each day. “If you need help in getting your children to school contact our office and we will offer our support,” said Anita.